Ready to geek out for a bit, and hopefully learn a little something new? Particularly if you really haven't "played" with the spiffy new Task Manager and Resource Monitor UIs that Windows Server 2012 and Windows 8 offer. These new versions of ancient Windows applications are far more than just force-quit apps on steroids. There's some rich functionality in there, if you just scratch past the surface a little. This particular video focuses on a look at what the Windows Server 2012 Essentials task called "Cleanup" is really doing, when run weekly by the Task Scheduler, or manually. It takes hours when there's 3TB to sift through/remove/de-dupe, so having some idea of how it really works, and what files it touches, and how hard it exercises the CPU/Disk/Network/Memory is quite interesting. Take a look for yourself, then hopefully be inspired to try out these apps for yourself, on your own Windows Server 2012 / Windows 8* system(s). 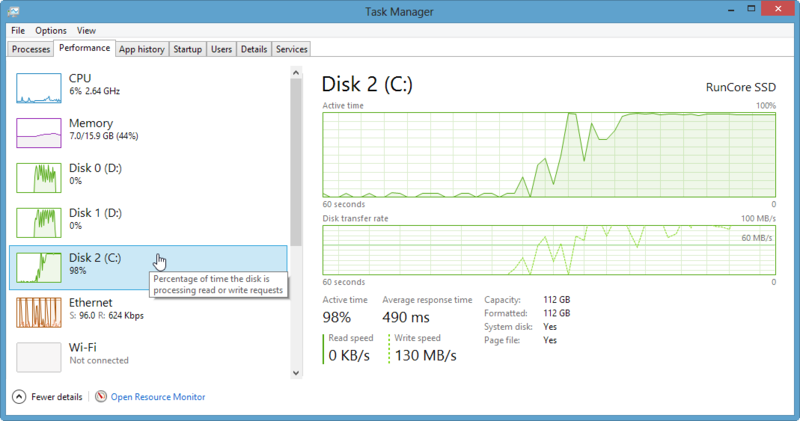 *Windows 8 Task Manager shows disk statistics right in the main view, without needing to "Open Resource Monitor" but is identical in function in nearly every other way. This can be seen pictured below, with my C: (an mSATA SSD on my W520 laptop) receiving a file copy from my D: drive (2x1TB drives in a Windows 8 Dynamic Disk RAID0). Had this file copy taken longer, the 2nd graph would have had the time for the display to re-scale. 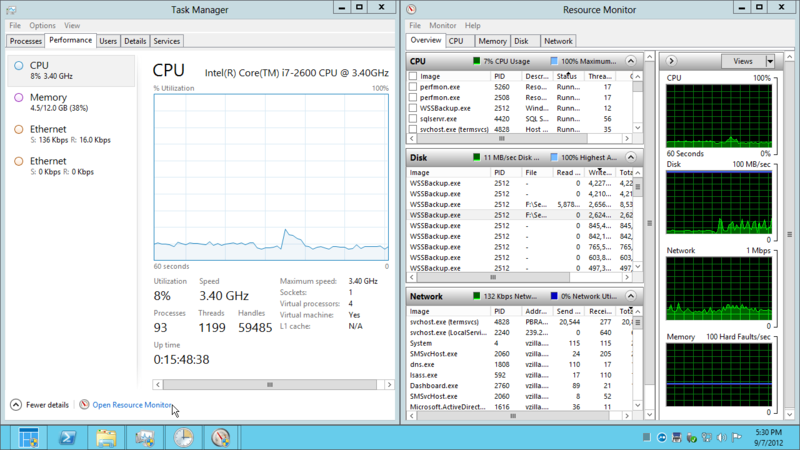 **I should have noted during the video that I did not have any other significant workload running on this ESXi 5.1 host that was running this VM, thus, I did not show the vSphere Console's Performance views, which would show identical disk I/O numbers. The focus was kept on the Windows OS tools, intended to keep the presentation applicable to both physical or virtual installations.